The "War to End All Wars" finally ended on the 11th day of the 11th month of the year of Our Lord, 1918. The American Dough boys who "went over there" started coming home. But for many of the returning veterans, their personal war was to continue. America was not ready to care for their grievous wounds, so it was up to the vets to take care of each other. The American Legion was created in Paris, France by the troops awaiting transport back to the states. Hammond attorney Floyd Murray was one of those men. With determination and perseverance, Murray organized the first American Legion Post in Lake County, Hammond Post 16, and Indiana's First District, which encompassed Lake County. On July 5, 1919, The American Legion issued a charter to Hammond Post 16. The early years for the veteran's organization was tough going. Most veterans wanted to forget the horrors they experienced in the European trenches and get on with their lives. The Post's first few meetings were held in Murray's Hohman Avenue law office. Eventually, the Post started meeting in a room at the Hammond Chamber of Commerce's building. By 1925, the membership of the Post had reached only 16 members. Rehabilitation of their war comrades was the main focus of the member's activities. Eventually, membership began to grow. The Post was able to purchase a permanent building to call its home. 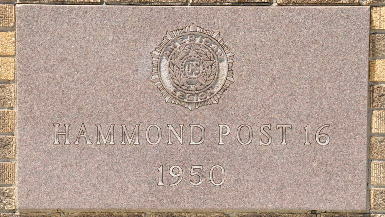 In 1937, the Post dedicated the building at 127 State Street in Hammond as the Post Home. The conclusion of the Second World War saw the ranks of the Legion swell. The Post quickly outgrew the State Street building and secured a larger headquarters at 6634 Calumet Avenue. This building was dedicated as the new Post Home in 1950. During the Post's early years, the WWI generation set the standards for governance and hospitality. The motto "The Post Where Hospitality is Host" was adopted. A war memorial was dedicated in Harrison Park on Hohman Avenue in Hammond in 1923. Maintained by the Post members with the assistance of the Ladies Auxiliary, the memorial served as a backdrop for the Post's annual Memorial Day and Veteran's Day observances. These moving observances attracted several other Legion posts, a VFW post, local politicians and other dignitaries as well as members of the community, and were one of the highlights of each year. Membership in Post 16 peaked in the 1950's with the entry of WWII and Korean War vets into the ranks of the Legion. Time began to take its toll on the WWI veterans, and the WWII vets began to assume leadership roles in the Post. Like most veterans’ organizations, membership is declining today, with the passing of the WWII veterans and a smaller pool of younger veterans eligible to join. Post 16 also began to experience a decline in membership. Older members were unable to accomplish as much as in the past. Bingo went by the wayside and as a result Post 16 lost a major source of income. Members began meeting at Munster Town Hall on September 14, 2010. A decision was made by the membership to sell the Post building, which was accomplished on February 14, 2011. The Post's leadership embarked upon a major strategic re-branding initiative. The major aspect of this campaign was to move the Post to Munster, Indiana and recruit new members in that town, which did not have an American Legion Post. The Post was granted a new charter in Munster in the fourth quarter of 2011. Although without a building, the Post is still able to meet at the Munster Town Hall, and remains active in both the community as well as Children & Youth activities, such as the American Legion High School Oratorical Scholarship Competition, the Flag Education program and Boy Scouts. With a renewed and refreshed vision, the Post in reinvigorated as it approached its Centennial Anniversary. Several younger veterans have assumed leadership roles and have instituted changes in the Post, such as this web site. At close of books in June 2016, membership stood at 139 with members continuing to provide service to their community, state and nation. Regular business meetings are held on the second Tuesday of each month, along with a number of social events during the course of the year, including the Legion Birthday Party each March and a Christmas party in December. The Post also conducts a solemn flag disposal ceremony in June or July. All qualified veterans are encouraged and invited to become members of Post 16 as our history moves along into the 21st Century. There is also an active unit of the American Legion Ladies Auxiliary at the Post. The ladies supervise the annual Poppy Day event, assist with the Memorial Day observance, and the various social events. There is also a squadron of the Sons of the American Legion (SAL). You can still see the cornerstone at the former Post Home, 6634 Calumet Avenue, Hammond.